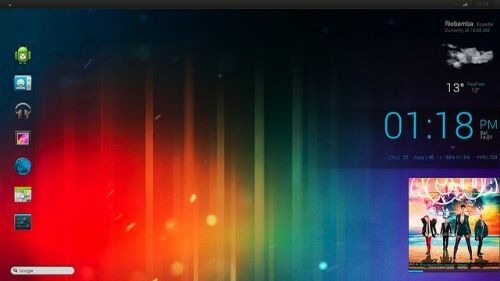 Install Ice Cream Sandwich on your PC Download If you are one of those who want to have this operating system also on the desktop of your PC,you can use this very interesting tool,which modifies the original theme and passes it to Android. There are two ways to do it, the difficult or the easy. Let's start with the ideal for experts. In this case you must have Windows 7,32 or 64 bits. The next step is to download and install the following programs in the same order: Ice Cream Sandwich Wallpaper,Rainmeter,Minimal Bar,Lexis Skin, Simplesentencethree, Google Search Bar, Roboto font, APPOWS2010, RocketDock and Ice Cream Sandwich Icon Pack. Now, if you do not have the time or desire to download all those programs, you can choose the option for beginners. This is to download in Android Skin 2.0 that replaces the boot and the home screen. Install the custom version, restart the computer and go.